For student ministries across the country the season is changing. Busy summers are turning into, what I hope, is an even busier fall. Not because of the amount of events or travel time — and not busier just for the sake of busyness. No one wants that. Instead, your fall season should be busier because of the immeasurable impact that can be made in your ministry, your church as a whole, and in your community as your students head back to school. Now is the time to think and act strategically to take advantage of the opportunity that is in front of you. Specifically, the opportunity that exists on your student’s school campuses. If you are called to lead in student ministry then you are called to be involved in ministry on school campuses. There’s no way out of it. Too many times we use the excuse “our schools are closed” to try and avoid it. Campus ministry is hard work. It can be awkward at times. It is also worth the effort. One of the best ways for your ministry to be a kingdom expanding student ministry is through the school campus. Here are six things you can do to win on the school campus this year. 2. Build relationships with key faculty. Start with the principal and work your way through the faculty from there. Have no agenda here other than relationship. As your relationship progresses so will your access to the school. Serve them well and earn their respect. You should also seek out relationships with the coaching staff. Some of you will be offended here because I focus on sports instead of other activities, but the reality is that our culture is driven by sports. When you have relationships with key coaches and you have their seal of approval, your ministry opportunities accelerate quickly. 3. Serve extra curricular activities. This is a simple, but effective, area of ministry. Deliver Popsicles to the football team, pass out programs at the band concert, give Gatorade to the basketball teams, host an activity’s end of year banquet at your church. I think you get the idea. Try to think of ways that you can just be present and serve the individual groups and clubs in your schools. Start with the activities that your students are involved with and work from there. 4. Be involved with Christian clubs. 5. Have a presence in the teacher’s lounge. Deliver cookies, coffee, doughnuts, lunch, and so on to the teacher’s lounge at your schools. Depending on your budget you can purchase this special gift or recruit volunteers within your church to cook potluck style dishes. Drop off the food and leave a thank you note addressed to the faculty. Often, they are a very under-appreciated group of people and a simple thank you will go a long way. 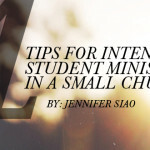 Remember, you aren’t just there to minister to the students. Often times you will find that you open doors of ministry with faculty as well. If you have attempted campus ministry for any length of time you have probably found it to be difficult. It takes time out of your day(s) logistically and relationally. It is frustrating and awkward at times. You will want to give up. As someone who has wanted to give up several times myself in this area, can I plead with you to stick it out? 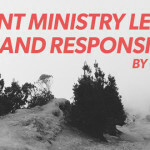 Can I beg you, for the sake of the Kingdom, to prioritize campus ministry? You may not see fruit initially and you may not see fruit this year, but you will see fruit. It is worth the effort. The mission field is ripe unto the harvest. I would love to hear from you on this topic. How have you approached campus ministry in your context?